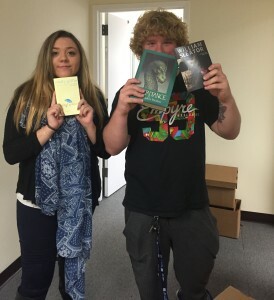 Thank you to Bridge of Books for donating eight boxes of books to NewBridge Jobs Plus, the longest-running alternative education program in Morris County. The donation filled two bookcases at NewBridge Jobs Plus’ new location in Parsippany and inspired the program to start a Drop Everything And Read!, a program in which students read for pleasure for 30 minutes a day. That’s NewBridge Jobs Plus participants Brittany Briggs and Tristano Mecionis enjoying the bounty of books.